Beautiful and rare map of the British Isles. Les Isles Britanniques qui contiennent les Royaumes d'Angleterre, Escosse, et Irlande distingués en leurs principales Provinces : subdivisées en leurs Shireries ou Comtés. 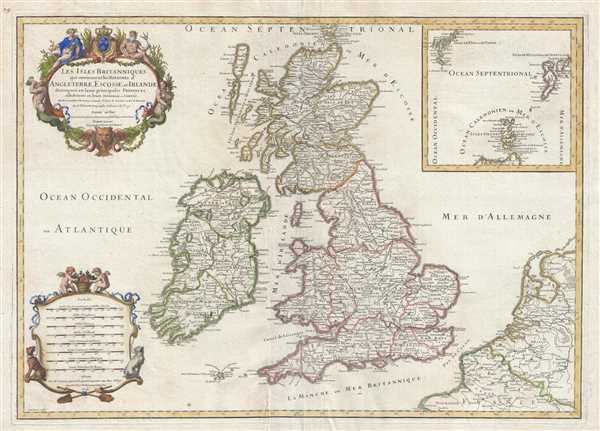 This is a rare 1709 Hubert Jaillot map of the British Isles. The map depicts the region from the Atlantic Ocean to the North Sea and from the Orkney Islands to the Pas de Calais and Normandy in northern France. England, Scotland, Wales, and Ireland are bordered in different colors, allowing for easy differentiation. Numerous cities, towns, and villages are labeled, along with the provinces. The smaller islands surrounding the two principal British Isles, such as the Orkney Islands, Skye Island, the Isle of Man, and the Isle of Wight. An inset map, situated in the upper-right corner, depicts the Orkney Islands, the Shetland Islands, and the Faroe Islands which are located north of Scotland in the North Sea. France and the Netherlands are illustrated in the lower right corner, in decent detail, with numerous labeled cities and town, including Dunkirk, Calais, Arras, Brussels, Louvain, and Bruges. A decorative title cartouche is situated in the upper left corner, with a decorative cartouche for the various scales in the lower left corner. This map was created by Hubert Jaillot in 1709 and was enlarged from a map created by Nicolas Sanson. Alexis-Hubert Jaillot (c. 1632- 1712) followed Nicholas Sanson (1600 - 1667) and his descendants in ushering in the great age of French Cartography in the late 17th and 18th century. The publishing center of the cartographic world gradually transitioned from Amsterdam to Paris following the disastrous inferno that destroyed the preeminent Blaeu firm in 1672. Hubert Jaillot was born in Franche-Comte and trained as a sculptor. When he married the daughter of the enlumineur de ala Reine, Nicholas Berey, he found himself positioned to inherit a lucrative map and print publishing firm. When Nicholas Sanson, the premier French cartographer of the day, died Jaillot negotiated with his heirs to republish much of Sanson's work. Though not a cartographer himself, Jaillot's access to the Sanson plates enabled him to publish numerous maps and atlases with only slight modifications and updates to the plates. As a sculptor and an artist, Jaillot's maps were particularly admired for their elaborate and meaningful allegorical cartouches and other decorative elements. Jaillot used his allegorical cartouche work to extol the virtues of the Sun King Louis IV, and his military and political triumphs. These earned him the patronage of the French crown who used his maps in the tutoring of the young Dauphin. In 1686 he was awarded the title of Geographe du Roi, bearing with it significant prestige and the yearly stipend of 600 Livres. Jaillot was one of the last French map makers to acquire this title. Louis XV, after taking the throne, replaced the position with the more prestigious and singular title of Premier Geographe du Roi. Jaillot died in Paris in 1712. His most important work was his 1693 Le Neptune Francois. Jalliot was succeed by his son, Bernard Jean Hyacinthe Jaillot (1673-1739), grandson, Bernard Antoine Jaillot (???? – 1749) and the latter's brother-in-law, Jean Baptiste-Michel Renou de Chauvigné-Jaillot (1710-1780). Nicolas Sanson (1600 - 1667) and his descendants were the most influential French cartographers of the 17th century and laid the groundwork for the Golden Age of French Cartography. Sanson started his career as a historian where, it is said, he turned to cartography as a way to illustrate his historical studies. In the course of his research some of his fine maps came to the attention of King Louis XIII who, admiring the quality of his work, appointed Sanson Geographe Ordinaire du Roi. Sanson's duties in this coveted position included advising the king on matters of geography and compiling the royal cartographic archive. In 1644 he partnered with Pierre Mariette, an established print dealer and engraver, whose business savvy and ready capital enabled Sanson to publish an enormous quantity of maps. Sanson's corpus of some three hundred maps initiated the golden age of French mapmaking and he is considered the 'Father of French Cartography.' His work is distinguished as being the first of the 'Positivist Cartographers,' a primarily French school of cartography that valued scientific observation over historical cartographic conventions. The practice result of the is less embellishment of geographical imagery, as was common in the Dutch Golden Age maps of the 16th century, in favor of conventionalized cartographic representational modes. Sanson is most admired for his construction of the magnificent atlas Cartes Generales de Toutes les Parties du Monde. Sanson's maps of North America, Amerique Septentrionale (1650), Le Nouveau Mexique et La Floride (1656), and La Canada ou Nouvelle France (1656) are exceptionally notable for their important contributions to the cartographic perceptions of the New World. Both maps utilize the discoveries of important French missionaries and are among the first published maps to show the Great Lakes in recognizable form. Sanson was also an active proponent of the insular California theory, wherein it was speculated that California was an island rather than a peninsula. After his death, Sanson's maps were frequently republished, without updates, by his sons, Guillaume (1633 - 1703) and Adrien Sanson (? - 1708). Even so, Sanson's true cartographic legacy as a 'positivist geographer' was carried on by others, including Alexis-Hubert Jaillot, Guillaume De L'Isle, Gilles Robert de Vaugondy, and Pierre Duval.